This account brings you hot items from public particle physics news sources, including CERN, SymmetryMagazine.org, and Interactions.org. "Race and disease risk and Berlin’s singing nightingales"
On the third floor of the central high-rise building at Fermi National Accelerator Laboratory, archivist Valerie Higgins’ office is full of odd treasures. There’s a wizard hat once worn by Nobel laureate and former lab director Leon Lederman, and a plaster bust of Manhattan Project physicist Robert Oppenheimer made by Fermilab’s founding director, Robert Wilson. There’s a trophy-shaped samovar of unknown origin—possibly a gift from tea-drinking Russian scientists. Stacked along one wall of shelves are around 30 humble green or brown boxes, each containing about 30 cassette tapes: oral histories that date back to the founding of the archives 40 years ago. The tapes contain interviews with people that have been instrumental in building the lab and the experiments that run there. Most of the interviews are with physicists. But some venture outside the detector halls to speak with the technical and support staff that make sure the physicists’ research takes place. Higgins, who has conducted around 50 oral history interviews herself, has been consciously adding to this category in her six years as Fermilab archivist. Higgins has authored a paper available in the online physics repository, arXiv, and earlier this month published an op-ed for Physics World on the importance of capturing perspectives from all parts of the laboratory. She sat down with Symmetry writer Lauren Biron to discuss her thoughts. What kinds of perspectives do you look to capture in your work? Since scientific research often involves such large numbers of people, and the experiments or projects can become like institutions unto themselves, you have to approach documenting things with an eye towards the entire project. You need to document the contributions not just of the scientists who were working on the experiment, accelerator or project you are interested in, but also other technical staff who may not be physicists—people like computer scientists, engineers and technicians—and then also people who might be considered non-technical, such as administrative assistants. I don’t think I fully understood or appreciated how many people are involved in making modern scientific research happen until I started my position here. In the paper, I listed some of the positions from Fermilab’s directory in 1969, and they include things like a nurse and an artist and a director of public information—positions someone unfamiliar with the lab might not expect to find here. We have accountants, the roads and grounds crew, the security staff. There are all sorts of different positions it takes to make the lab run. The site is 6800 acres and there are thousands of employees and scientists from collaborating institutions, so of course there are these sorts of positions. But until you stop to think about what it takes to run the lab, that might not occur to you. I try to get as broad a slice as I can. For instance, when I started, we hadn’t documented as much of the computing as we would have liked to, but former lab archivist Adrienne Kolb and I worked together to start to remedy that. We have interviews with people from the education office, human resources, directors, assistant directors, high level administrators, administrative assistants, technicians. I would like to get more technicians and engineers. What are the benefits of capturing information from non-scientific staff in oral histories, particularly compared to more traditional records? You don’t want to think of oral histories as a replacement for other records. They definitely have their limitations. There’s the fallibility of human memory. Sometimes people will just be flat out inaccurate, like on dates. Some things are more subjective and people will remember them different ways. What makes oral histories valuable is actually that subjectivity. There are things you can capture in an oral history interview that you just don’t get from the records, or that never made it into the records. There are the reasons decisions were made or ways in which things were done. It’s the day-to-day stuff that isn’t written down anywhere or formalized in such a way that won’t make it into the records. Sometimes everyone just knows that stuff, so it’s not written down, but then 20 or 30 years later, not everyone knows that assumed knowledge. Fermilab has a very strong oral history program in the archives that dates back to the beginning of the archives in 1978. Right off the bat they were doing oral history interviews with people. We have over 1000 tapes of interviews, and now we have digital files of more recent interviews. While we’ve focused on interviewing non-scientific people more recently, they did some of that even in the early days. I’ve found those interviews to have very interesting content and to be unique perspectives on the early history of the lab. One of the things that can be valuable, particularly with people such as administrative assistants, is they can provide more of an outside view on what’s happening in the experiment or project. They often are not involved in a highly specialized area—they often have more general knowledge and know more about how the different areas interact. One thing I found with the oral history interviews was that a lot of people I interviewed who were non-technical have really appreciated that I wanted to interview them and saw their contributions to the lab as valuable. I’ve encountered some staff who are baffled and say, “Why do you want to talk to me, I haven’t done anything that important.” But then when I interview them, it always turns out that they did important things that were key to the success of the lab. What kinds of things are you missing from the early days of the lab? One example is the bubble chamber film scanners, the teams of mostly women who looked through images for potentially interesting particle events from a detector. So far, I have not found any interviews with the bubble chamber film scanners. I haven’t found anything other than the articles written about them. That would be interesting if we had it—an interview with someone explaining what their day to day work was like, and what they did, and how they interacted with physicists. As far as I can tell, that doesn’t seem to exist. There wouldn’t have been any other records that documented something like that. That’s the sort of thing you’re only going to get from an oral history interview. Have you found things that surprised you? I’ve found very interesting things, like the interview with Robert Wilson’s first primary administrative assistant, Priscilla Duffield, who had also been assistant to Ernest Lawrence [who won the Nobel Prize for inventing the cyclotron particle accelerator] and Robert Oppenheimer [who led Los Alamos National Laboratory during the Manhattan Project and later advocated against nuclear proliferation]. One of the frustrations with oral histories is you sometimes hear something really interesting and wish you could ask for more detail. She only gives a few sentences about it, but Duffield briefly talks about the different leadership and decision-making styles that she saw in Wilson versus Oppenheimer versus Lawrence, and I thought that was a really cool thing to find. I don’t know if this is surprising, but it’s fun to hear about some of the cultural events that went on at the lab. You might have some photos from an event, but you don’t usually have many records that tell you about the games or food or funny things that people did or said. I suppose it might sound frivolous, but some of those things give you insight into what the life at the lab was like at that time. What do you hope people will learn from your recent work? I think the most relevant thing for anyone to be aware of is the importance of people who are in the support roles. Be aware of their importance if you’re an archivist trying to document modern scientific research, if you’re a historian writing about this work, if you’re a scientist involved in the work. Remember that these people are also making that research happen. And if you are a support person, be aware that your work is important and valuable. It’s not just scientists who make these experiments happen and who make this lab run—it also takes people with other interests and talents that align. "XENON1T Scientists Observe the Rarest Decay Process Ever Measured in the Universe"
The universe is almost 14 billion years old. An inconceivable length of time by human standards – yet compared to some physical processes, it is but a moment. There are radioactive nuclei that decay on much longer time scales. An international team of scientists has now directly measured the rarest decay process ever recorded in a detector. Using the XENON1T detector which mainly searches for dark matter at the INFN Gran Sasso National Laboratory, the researchers were able to observe the decay of Xenon-124 atomic nuclei for the first time. The half-life of a process is the time after which half of the radioactive nuclei present in a sample have decayed away. The half-life measured for Xenon-124 is about one trillion times longer than the age of the universe. This makes the observed radioactive decay, the so-called double electron capture of Xenon-124, the rarest process ever seen happening in a detector. “The fact that we managed to observe this process directly demonstrates how powerful our detection method actually is – also for signals which are not from dark matter,” says Prof. Christian Weinheimer from the University of Münster (Germany) whose group lead the study. 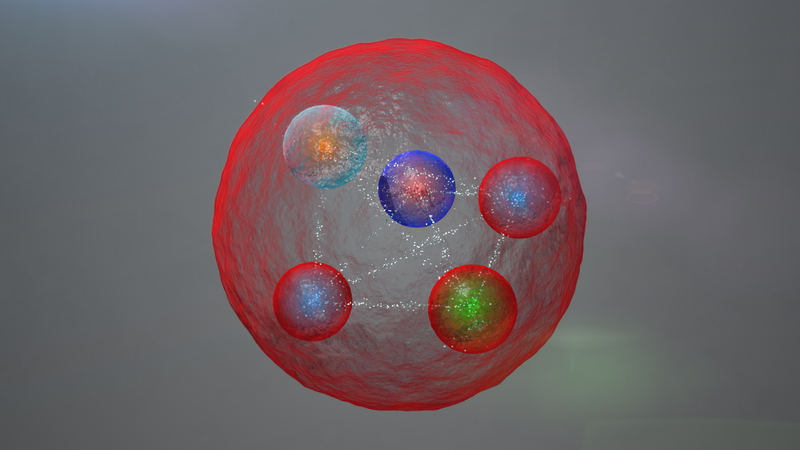 In addition, the new result provides information for further investigations on neutrinos, the lightest of all elementary particles whose nature is still not fully understood. XENON1T is a joint experimental project of about 160 scientists from Europe, the US and the Middle East. The results were published in the science journal “Nature”. The Gran Sasso Laboratory of the National Institute for Nuclear Physics (INFN) in Italy, where scientists are currently searching for dark matter particles is located about 1,400 meters beneath the Gran Sasso massif, well protected from cosmic rays which can produce false signals. Theoretical considerations predict that dark matter should very rarely “collide” with the atoms of the detector. This assumption is fundamental to the working principle of the XENON1T detector: its central part consists of a cylindrical tank of about one meter in length filled with 3,200 kilograms of liquid xenon at a temperature of –95° C. When a dark matter particle interacts with a xenon atom, it transfers energy to the atomic nucleus which subsequently excites other xenon atoms. This leads to the emission of faint signals of ultraviolet light which are detected by means of sensitive light sensors located in the upper and lower parts of the cylinder. The same sensors also detect a minute amount of electrical charge which is released by the collision process. The new study shows that the XENON1T detector is also able to measure other rare physical phenomena, such as double electron capture. To understand this process, one should know that an atomic nucleus normally consists of positively charged protons and neutral neutrons, which are surrounded by several atomic shells occupied by negatively charged electrons. Xenon-124, for example, has 54 protons and 70 neutrons. In double electron capture, two protons in the nucleus simultaneously “catch” two electrons from the innermost atomic shell, transform into two neutrons, and emit two neutrinos. The other atomic electrons reorganize themselves to fill in the two holes in the innermost shell. The energy released in this process is carried away by X-rays and so-called Auger electrons. However, these signals are very hard to detect, as double electron capture is a very rare process which is hidden by signals from the omnipresent natural radioactivity. This is how the XENON collaboration succeeded with this measurement: The X-rays from the double electron capture in the liquid xenon produced an initial light signal as well as free electrons. The electrons were moved towards the gas-filled upper part of the detector where they generated a second light signal. The time difference between the two signals corresponds to the time it takes the electrons to reach the top of the detector. Scientists used this interval and the information provided by the sensors measuring the signals to reconstruct the position of the double electron capture. The energy released in the decay was derived from the strength of the two signals. All signals from the detector were recorded over a period of more than one year, however, without looking at them at all as the experiment was conducted in a “blind” fashion. This means that the scientists could not access the data in the energy region of interest until the analysis was finalized to ensure that personal expectations did not skew the outcome of the study. Thanks to the detailed understanding of all relevant sources of background signals it became clear that 126 observed events in the data were indeed caused by the double electron capture of Xenon-124. Using this first-ever measurement, the physicists calculated the enormously long half-life of 1.8×1022 years for the process. This is the slowest process ever measured directly. It is known that the atom Tellurium-128 decays with an even longer half-life, however, its decay was never observed directly and the half-life was inferred indirectly from another process. The new results show how well the XENON1T detector can detect rare processes and reject background signals. While two neutrinos are emitted in the double electron capture process, scientists can now also search for the so-called neutrino-less double electron capture which could shed light on important questions regarding the nature of neutrinos. XENON1T acquired data from 2016 until December 2018 when it was switched off. The scientists are currently upgrading the experiment for the new “XENONnT” phase which will feature a three times larger active detector mass. Together with a reduced background level this will boost the detector’s sensitivity by an order of magnitude. The other laboratories of INFN are based in Catania, Frascati (Rome) and Legnaro (Padua); the whole network of laboratories house large equipment and infrastructures available for use by the national and international scientific community. The National Institute for Nuclear Physics (INFN) is the Italian research agency dedicated to the study of the fundamental constituents of matter and the laws that govern them, under the supervision of the Ministry of Education, Universities and Research (MIUR). It conducts theoretical and experimental research in the fields of subnuclear, nuclear and astroparticle physics. Prof. Elena Aprile, Columbia University, New York, US. "Serbian flag raised at CERN"
The Serbian flag was raised today at a ceremony on the Esplanade des Particules to mark the country’s accession as CERN’s 23rd Member State. The ceremony was attended by the Prime Minister of the Republic of Serbia, Ana Brnabić, the President of the CERN Council, Ursula Bassler, and the CERN Director-General Fabiola Gianotti, together with representatives of CERN’s Member and Associate Member States and the CERN community. “The 23rd of April is a great day for Serbia and its science, as the flag of the Republic of Serbia is officially hoisted in front of CERN in Geneva, marking Serbia’s accession as its 23rd full Member. This will allow our researchers to work in higher capacity and on a global level with their colleagues from CERN, while enabling our economy to participate in CERN projects on a larger scale. Membership in CERN presents Serbia in the best light, as a modern, competitive country whose economic development increasingly relies on science and innovation, driven by our young scientists and innovators,” said Ana Brnabić, Prime Minister of the Republic of Serbia. “This is the moment when the commitment of a new Member State becomes visible: the commitment to support fundamental science, to foster peaceful collaboration and to engage in multilateral initiatives for the benefit of all. We are pleased to raise the Serbian flag among those of our Member States,” said Ursula Bassler, President of the CERN Council. “It is a great pleasure to welcome Serbia to the CERN family. This day recognises the long history of fruitful scientific cooperation between Serbia and CERN, and Serbia’s commitment to fundamental research. We look forward to strengthening our collaboration in particle physics, innovation, and training and education of the young generations, with Serbia as a Member State,” said Fabiola Gianotti, CERN Director-General. But where does this falsifiability requirement leave certain areas of theoretical physics? String theory, for example, involves physics on extremely small length scales unreachable by any foreseeable experiment. Cosmic inflation, a theory that explains much about the properties of the observable universe, may itself be untestable through direct observations. Some critics believe these theories are unfalsifiable and, for that reason, are of dubious scientific value. Take, for example, supersymmetry. SUSY is an extension of the Standard Model in which each known particle is paired with a supersymmetric partner. The theory is a natural outgrowth of a mathematical symmetry of spacetime, in ways similar to the Standard Model itself. It’s well established within particle physics, even though supersymmetric particles, if they exist, may be out of scientists’ experimental reach. However, the broad framework of supersymmetry can accommodate even more massive SUSY particles, which may or may not be detectable using the LHC. In fact, if naturalness is abandoned, SUSY doesn’t provide an obvious mass scale at all, meaning SUSY particles might be out of range for discovery with any earthly particle collider. That point has made some critics queasy: If there's no obvious mass scale at which colliders can hunt for SUSY, is the theory falsifiable? Prescod-Weinstein argues that we're a long way from ruling out all dark matter possibilities. "How will we prove that the dark matter, if it exists, definitively doesn’t interact with the Standard Model?" she says. "Astrophysics is always a bit of a detective game. Without laboratory [detection of] dark matter, it’s hard to make definitive statements about its properties. But we can construct likely narratives based on what we know about its behavior." Beyond falsifiability of dark matter or SUSY, physicists are motivated by more mundane concerns. “Even if these individual scenarios are in principle falsifiable, how much money would [it] take and how much time would it take?” Slatyer says. In other words, rather than try to demonstrate or rule out SUSY as a whole, physicists focus on particle experiments that can be performed within a certain number of budgetary cycles. It's not romantic, but it's true nevertheless. Historically, sometimes theories that seem untestable turn out to just need more time. For example, 19th century physicist Ludwig Boltzmann and colleagues showed they could explain many results in thermal physics and chemistry if everything were made up of "atoms"—what we call particles, atoms, and molecules today—governed by Newtonian physics. For instance, Einstein’s theory of general relativity is one of the best-tested theories in all of science. At the same time, it allows for physically unrealistic “universes,” such as a "rotating" cosmos where movement back and forth in time is possible, which are contradicted by all observations of the reality we inhabit. On that note, Caltech cosmologist Sean M. Carroll argues that many very useful theories have both falsifiable and unfalsifiable predictions. Some aspects may be testable in principle, but not by any experiment or observation we can perform with existing technology. Many particle physics models fall into that category, but that doesn’t stop physicists from finding them useful. SUSY as a concept may not be falsifiable, but many specific models within the broad framework certainly are. All the evidence we have for the existence of dark matter is indirect, which won't go away even if laboratory experiments never find dark matter particles. Physicists accept the concept of dark matter because it works. "Week 14 at the Pole"
"How dental plaque reveals the history of dairy farming, and how our neighbors view food waste"
"What gravitational waves can say about dark matter"
In the universe, space and time are invariably linked as four-dimensional spacetime. For simplicity, you can think of spacetime as a blanket suspended above the ground. Jupiter might be a single Cheerio on top of that blanket. The sun could be a tennis ball. R136a1—the most massive known star—might be a 40-pound medicine ball. "Successful tests of a cooler way to transport electricity"
The line is more compact and lighter than its copper equivalent, and it is cryogenically more efficient than a classical low temperature superconducting link that must be cooled to 4.5 K.
"A new edition of the IceCube Masterclass makes new connections with students"
"Cinque studenti abruzzesi tra i ragazzi dei raggi cosmici al Gran Sasso"
"Week 13 at the Pole"
There’s still just a bit of sunlight lingering, as seen in the image—what’s not so easily discernible in the image are the stars, but the winterovers report having seen them for the first time in months. "A new species of ancient human and real-time evolutionary changes in flowering plants"
"LHCb results add clues to pentaquark mystery"
"Assegnato a Lorenzo Pagnanini il premio Bruno Rossi"
"Astronomers capture first image of a black hole"
The EHT observations use a technique called very-long-baseline interferometry (VLBI). which synchronizes telescope facilities around the world and exploits the rotation of our planet to form one huge, Earth-size telescope observing at a wavelength of 1.3 mm. VLBI allows the EHT to achieve an angular resolution of 20 micro-arcseconds—enough to read a newspaper in New York from a sidewalk café in Paris. "LS2 Report: SPS receives major facelift for new beam dump"
From a young age, Philip Schuster knew he wanted to go into particle physics. As an undergraduate, he became involved in a number of research projects with experimentalists. But, like many other students pursuing a career in physics, he reached a point when he had to narrow his path. As much as he enjoyed the hands-on feeling of experiments, Schuster felt a stronger pull down the theory route. But he continued to keep an eye on what was happening in the world of experiment. Toward the end of his graduate education around 2007, Schuster wound up embedded with an experimental group working with data from the Large Hadron Collider. Although his work was still theoretical, this experience rekindled an interest in experimental physics that carried through into his postdoctoral fellowship. Together with Natalia Toro, also a theorist SLAC, and Rouven Essig, a theorist at Stony Brook University, Schuster began developing a series of ideas for an experiment that could leverage existing equipment to look for new forces that might be related to dark matter. The three teamed up with Bogdan Wojtsekhowski, an experimentalist at Thomas Jefferson National Accelerator Facility, to co-lead the experiment, called A Prime Experiment, or APEX. At the time, spearheading experiments was considered a dangerous move for theorists. Many feared that physicists could end up falling into the cracks between theory and experiment, landing in a place where their work would be unappreciated by both sides. But the seemingly impossible hunt for dark matter called for new approaches. “We knew we were taking a risk,” Schuster says. “And because so few people were doing it at the time, the risk felt even more vivid. There wasn’t always so much distinction between experiment and theory in physics. From Galileo Galilei to Isaac Newton, many of the great physicists had to use both theory and experiment. But as the field expanded, so did the scale of the experiments and the complexity of the theory. The larger and more challenging the experiments grew, and the more elaborate the theories became, the higher the level of specialization and expertise scientists required to work on them. But in the past decade, a new trend has emerged. In the scramble to detect dark matter particles, more and more theorists have been dreaming up experiments that can tackle the problem from new perspectives. A large part of this, Essig says, is that physicists have been expanding the type of dark matter candidates they’re interested in, requiring new ideas on how to find them. 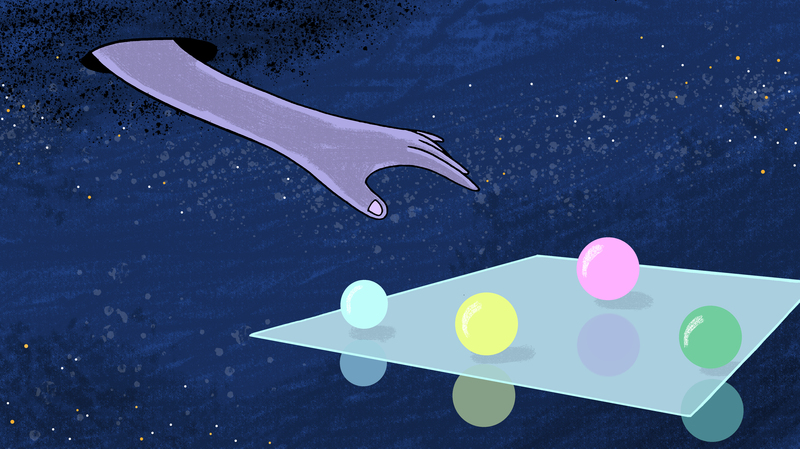 To broaden the search for dark matter, physicists have gone back to the basics, in a way—designing smaller-scale experiments that can often fit on tabletops. These smaller and less expensive experimental setups and collaborations provide a perfect avenue for theorists to explore new ideas. Many of these small experiments are fueled by collaboration between theorists and experimentalists. Recently, Feng worked with experimentalists to design FASER, a small dark matter experiment sitting in the LHC tunnel that looks for exotic weakly interacting particles produced in collisions. David Casper, an experimentalist involved in the project, says that Feng and the other theorists have been instrumental in the process. This synergy between theorists and experimentalists in the hunt has been a driving force for why many physicists do what they do. Lisanti says she’s always been interested in flying close to the interface between the two disciplines. Now, the trend of theorists proposing experiments has become so common that it’s almost expected of new students entering the field. The hope is that flooding the field with new ideas could finally lead to the discovery of dark matter. "Week 12 at the Pole"